Women's Rugby On Saturday, the top two Ivy League Rugby and National Intercollegiate Rugby Association teams went head-to-head with the Big Green dominating Harvard University 55-13. At the end of each academic year, The Dartmouth’s sports section puts up players to be voted upon by the student body as the best of the best. 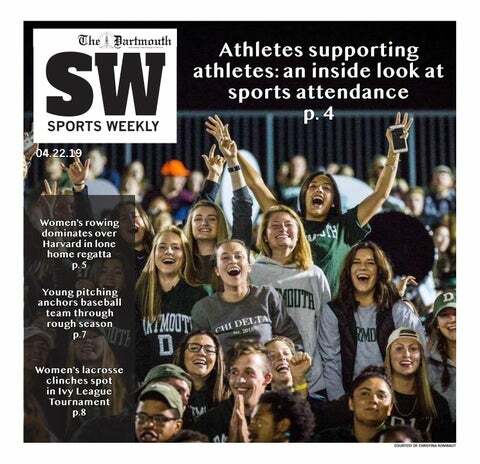 At the end of each academic year, The Dartmouth’s sports section puts up players and moments to be voted upon by the student body as the best of the best. Matt Herzig ’17, a former member of the cross country and track and field teams at Dartmouth, finished in 12th place overall at the 2018 Boston Marathon with a time of 2:27:55 and a pace of 5:39. This past weekend, the United States Associate of Collegiate Fencing Clubs hosted the 2018 USACFC National Championships, in which the Dartmouth College Fencing Club took home a total of eight titles from the team and individual events, earing the overall combined championship title. Dartmouth football improved in the 2017-2018 season, going overall 8-2 and 5-2 in Ivy League play under the direction of quarterback and tri-captain Jack Heneghan ’18. After graduating a record eight seniors the year prior, the women’s volleyball program appeared to be in a rebuilding year for the 2017-2018 season. Isalys “Ice” Quiñones ’19 has been a consistent leader for the Big Green as one of only three players to average double digits each game; she records 10.1 points per game.